It's years since we have been hearing about the Toyota Yaris is coming to India. In fact, renderings were made of what the car would look like more than half a decade ago. But Toyota waited and watched before making a move, considering the fact that the segment the Yaris is positioned in, is one of the most important ones in the country. 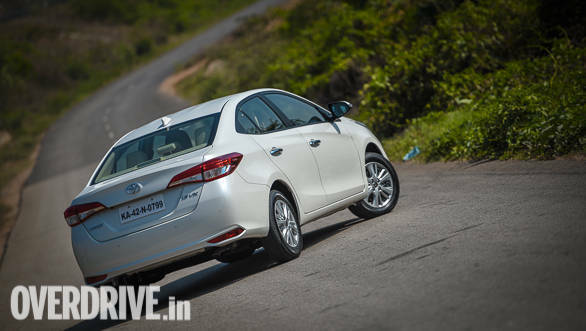 And the car is now here in the form of a feature-rich sedan, including a few segment firsts. Interestingly, Toyota has chosen to launch the Yaris with a petrol engine only for now. We put it under the road test scalpel to tell you what the car is like to drive in the real world. In a segment where style is of paramount importance, the Yaris comes with Toyota's typical conservative approach. The design language isn't aggressive  there's a friendliness to the face, though it isn't particularly appealing. The shade of red our test car wore looked nice, especially since it helped the Yaris offer a slightly more vibrant feel than what the design suggests. Also, only the top of the line VX variant gets a strip of LEDs as its daytime running lamps  the car you see here is the second most expensive variant after the VX, but does not get DRLs which is slightly disappointing. The tail lights certainly look good on the other hand  they wrap around onto the sides, which along with the distinctive design of the tail lamp cluster makes for an upmarket appearance. As is the norm with the segment the Yaris also gets a 'shark-fin' antenna, apart from which the roof gets ridges along its length, which look good. The hood has a few protruding lines as well, which give the front end a little hint of sportiness. I wish the lights at either end were placed lower, as that would have made for a sportier stance. The gaps in the wheels arches could have been smaller to offer the same effect. What stands out here though is the excellent build quality  be it the solidness with which the doors shut or the paint quality, the Yaris boasts a built to last feel, something Toyota has always offered. 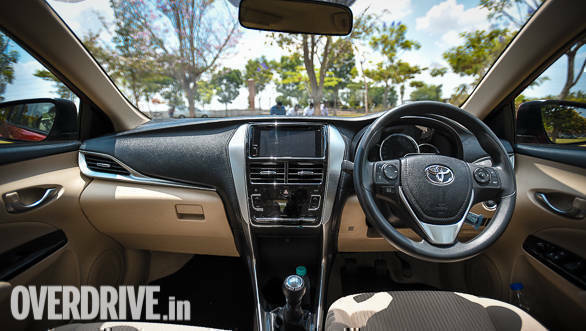 Most cars in the segment currently sport two-tone, beige-black interiors and the Yaris does not buck that trend. In fact, it also gets an additional shade of silvery-grey on the dashboard which makes for a nice contrast when viewed from a distance. It wears a glossy finish though, which makes for a plasticky feel when viewed closely. Quality of plastics overall could have been better too. The storage area under the air-conditioning controls is spacious and the cup holders in fact have enough space vertically to hold, say, two 500ml glasses of soft drinks. Toyota is offering leather upholstery only in the VX variant, which means the V variant you see here makes do with fabric upholstery. The feature list is pretty impressive on the other hand, including several segment firsts. The Yaris is the first and only car in its segment currently to get roof-mounted rear air-conditioning vents, as also seven airbags as standard. The V and VX variant also come equipped with disc brakes all-round, auto-headlamps with a follow-me-home function, rain sensing wipers and front parking sensors apart from the rear ones, and not to mention, a reverse camera. The V variant does not get gesture control for the music system though and also misses out on Apple CarPlay and Android Auto connectivity, as these are exclusive only to the VX variant. The Yaris isn't the most spacious car in its segment when it comes to interior space. The driver's foot well is cramped as there is no dead pedal or room for the driver to rest his left foot. Move to the rear and you'll notice that leg and kneeroom are decent, but not best in class. Headroom isn't the most generous either and egress from the rear seat is slightly constrained due to the B-pillar too. What is impressive about the Yaris's rear seat though is the comfort it offers, be it in terms of under thigh support or the recline angle of the seatback. The Yaris is powered by a four-cylinder 1.5-litre petrol engine. The engine produces 107PS and 140Nm and feels extremely refined. In fact, the engine is so smooth and quiet at idle that you can barely tell if it is running. On the go the engine does make itself audible, but always in a soft, slightly sporty manner. The engine is mated to a six-speed manual transmission and gears slot in well, though the shift from third down to second in our test car was slightly notchy. A seven-speed CVT is on offer with all variants as well, which is impressive considering the fact that traditionally manufacturers have offered the option of an automatic transmission only in top variants. 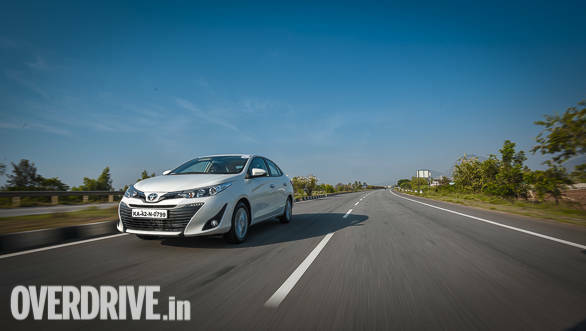 The Yaris managed to clock a 0-100kmph time of 12.37 seconds in our acceleration tests, which is not the quickest in the segment, but the engine is quick to build revs and also sounds sporty as you rev higher. In-gear acceleration is good and ratios are well-spaced, which means you don't need to work the six-speed gearbox too much in traffic. 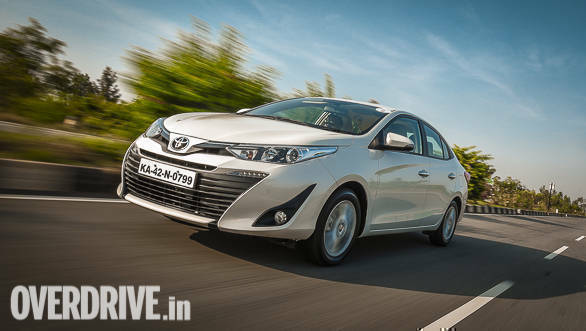 When it comes to fuel efficiency, the Yaris certainly impressed on the highway by returning a highly impressive 19.53kmpl, though the figure dropped down to 9.53kmpl in the city. This is where the Yaris impresses the most. 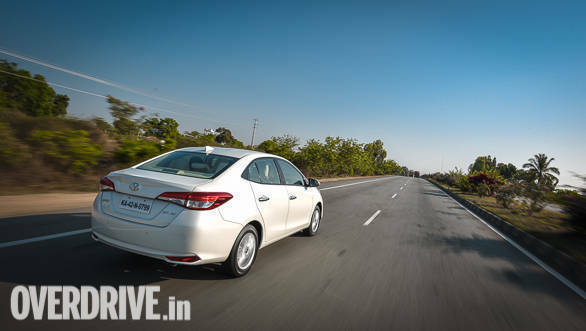 Its ride and handling package is one of the most balanced ones in the segment as not only does the car boast excellent bump-absorption abilities, but it also offers a sporty, confident and planted feel. The Yaris does not lose composure even when going fast over broken roads and doesn't unsettle occupants either. The experience over potholes is also quiet, with almost no thuds at all. 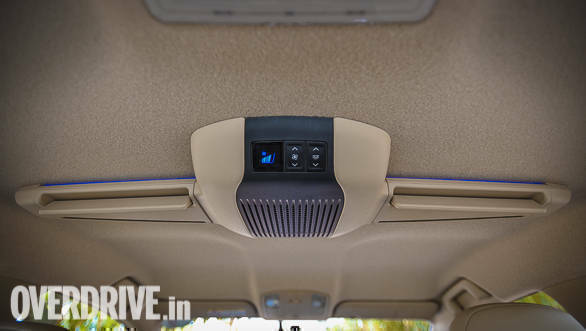 That said, the cabin is prone to letting road and tyre noise into the cabin and sound insulation could have been better to offer a quieter in-cabin experience at highway speeds. The Yaris feels confident when going fast around corners and can handle mid-corner bumps well too. Quick lane changes at speeds are never a problem either. On the whole, the Yaris is one of the better handling cars in its segment. Steering feel and feedback are reasonably good as well, though the steering rim is a little too thick. The steering feels slightly heavy at slow speeds but the weighted feel helps at higher speeds, thus affording more confidence. The Yaris also boasts excellent braking prowess, as having disc brakes all round helps it offer instant retardation. The Toyota Yaris is immensely impressive on several fronts. The styling may not be as aggressive or sporty as some of its rivals, but scratch beneath the surface and the Yaris is a truly capable car and also comes with the bullet-proof reliability Toyota is known to offer. 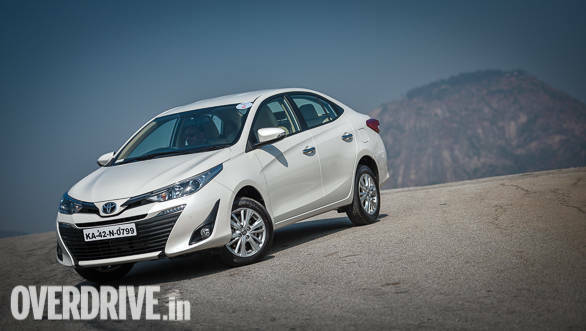 It faces off against well-established names like the Honda City and Hyundai Verna, which means the car has its task cut out rather well. With prices beginning from Rs 8.75 lakh for the base variant the Yaris is priced competitively, but if high equipment levels are your thing, you will need to look at the V variant at least, which is priced at Rs 11.70 lakh for the manual version and Rs 12.90 lakh for the automatic. These prices are on the higher side, but the V variant gets features and equipment which the competition does not offer even as option, making it a lucrative package, if in the market for a midsize sedan.